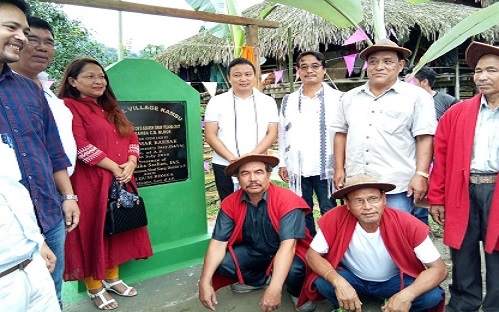 Parliamentary Secretary for Sports and Youth Affairs, Nyamar Karbak on Monday laid the foundation stone for Kambu model village under Chief Minister’s Adarsh Gram Yojana (CMAGY) here. Kambu, which falls in the Kamba circle of West Siang district, is one of the oldest villages under 27 Liromoba Assembly ST Constituency and has a population of more than 600. Asserting all developmental activities in the constituency would be taken up in phased manner, Karbak, who is also the local legislator, assured that all the villages which fall under the 27 Liromoba Assembly ST Constituency would soon be converted into a Model Village. He further called upon the locals to always keep surroundings clean and hygienic and asked the stakeholders to extend cooperation so that the “true status of a model village is achieved” as envisioned by Chief Minister Pema Khandu. Under CMAGY a total of 60 model villages (one village per ‘legislative assembly constituency) will be developed initially within a period of 2 years. Selection of the villages is normally done by a committee headed by the deputy commissioner along with heads of offices of respective districts and the concerned MLAs. A total outlay of Rs 1.5 crore would be provided in three phases for the physical and infrastructural development of the particular village. Also to speak on the occasion was West Siang BJP in-charge, Tayek Goi who urged upon the youths to take up economic activities in rural tourism, agriculture and also take advantage of the schemes and policies launched by the state and central governments. Among others, Aalo DPO Henge Riba and circle officer Sara Borang were present on the occasion.